Biogas typically refers to a gas produced by the biological breakdown of organic matter in the absence of oxygen. Biogas originates from biogenic material and is a type of biofuel. Biogas is produced by anaerobic digestion or fermentation of biodegradable materials such as biomass, manure, sewage, municipal waste, green waste, plant material and energy crops. This type of biogas comprises primarily methane and carbon dioxide. Other types of gas generated by use of biomass is wood gas, which is created by gasification of wood or other biomass. This type of gas consist primarily of nitrogen, hydrogen, and carbon monoxide, with trace amounts of methane. The gases methane, hydrogen and carbon monoxide can be combusted or oxidized with oxygen. Air contains 21% oxygen. This energy release allows biogas to be used as a fuel. Biogas can be used as a low-cost fuel in any country for any heating purpose, such as cooking. It can also be used in modern waste management facilities where it can be used to run any type of heat engine, to generate either mechanical or electrical power. 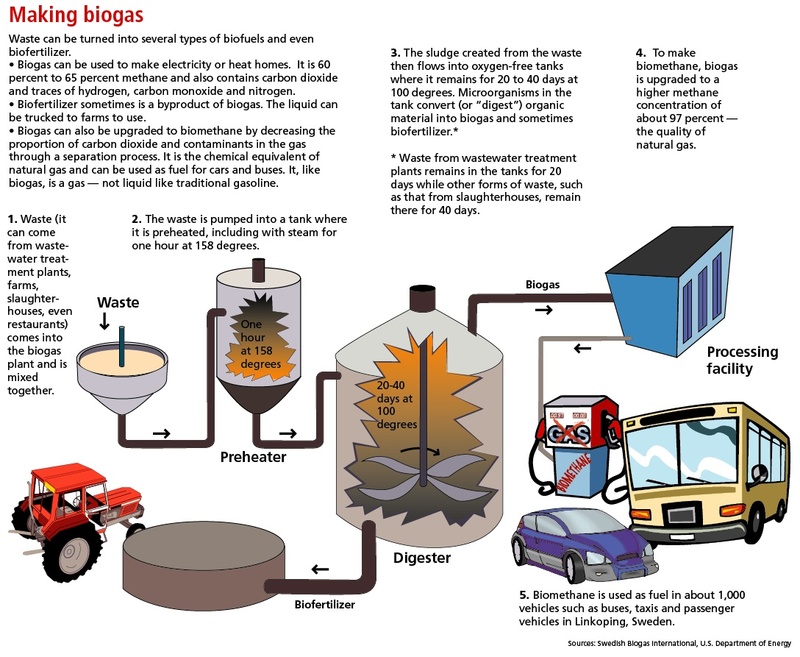 Biogas can be compressed, much like natural gas, and used to power motor vehicles. In the UK, for example, It is estimated to have the potential to replace around 17% of vehicle fuel. Biogas is a renewable fuel, so it qualifies for renewable energy subsidies in some parts of the world. A biogas plant is the name often given to an anaerobic digester that treats farm wastes or energy crops, can be produced utilizing anaerobic digesters. These plants can be fed with energy crops such as maize silage or biodegradable wastes including sewage sludge and food waste. During the process, an air-tight tank transforms biomass waste into methane producing renewable energy that can be used for heating, electricity, and many other operations that use any variation of an internal combustion engine, such as GE Jenbacher gas engines. There are two key processes: Mesophilic and Thermophilic digestion. In experimental work at University of Alaska Fairbanks, a 1000 litre digester using psychrophiles harvested from "mud from a frozen lake in Alaska" has produced 200–300 litres of methane per day, about 20–30 % of the output from digesters in warmer climates. Landfill gas is produced by wet organic waste decomposing under anaerobic conditions in a landfill. The waste is covered and mechanically compressed by the weight of the material that is deposited from above. This material prevents oxygen exposure thus allowing anaerobic microbes to thrive. This gas builds up and is slowly released into the atmosphere if the landfill site has not been engineered to capture the gas. Landfill gas is hazardous for three key reasons. Landfill gas becomes explosive when it escapes from the landfill and mixes with oxygen. The lower explosive limit is 5% methane and the upper explosive limit is 15% methane. The methane contained within biogas is 20 times more potent as a greenhouse gas than carbon dioxide. Therefore uncontained landfill gas which escapes into the atmosphere may significantly contribute to the effects of global warming. In addition landfill gas' impact in global warming, volatile organic compounds (VOCs) contained within landfill gas contribute to the formation of photochemical smog. Methane within biogas can be concentrated via a biogas upgrader to the same standards as fossil natural gas(which itself has had to go through a cleaning process), and becomes biomethane. If the local gas network allows for this, the producer of the biogas may utilize the local gas distribution networks. Gas must be very clean to reach pipeline quality, and must be of the correct composition for the local distribution network to accept. Carbon dioxide, water, hydrogen sulfide and particulates must be removed if present. If concentrated and compressed it can also be used in vehicle transportation. Compressed biogas is becoming widely used in Sweden, Switzerland, and Germany. A biogas-powered train has been in service in Sweden since 2005. Biogas has also powered automobiles. In 1974, a British documentary film entitled Sweet as a Nut detailed the biogas production process from pig manure, and how the biogas fueled a custom-adapted combustion engine. please elaborate the process of using biogas for powering automobiles. What will be the power of automobiles that are run by biogas. and please explain the impact of these automobiles compared to engines run by fossil fuels.